Insights into expectations, drivers and barriers related to sustainable bioeconomy around the world are essential for international policy and collaboration. 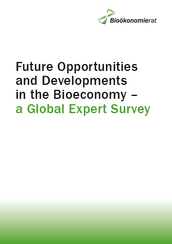 The findings of this global expert survey indicate that bioeconomy is viewed as central to achieving many of the UN Sustainable Development Goals. Innovations are key in this respect. Besides satisfying food and energy security, bioeconomy is considered central to climate protection and to innovative industrial transformation. Bioeconomy also entails transitioning to sustainable consumption. In preparation for the Global Bioeconomy Summit 2018 in Berlin, the German Bioeconomy Council decided to commission this survey exploring the key topics of concern to experts around the world.